India should announce prizes for innovations and overhaul the education system apart from taking a range of other initiatives to promote innovation and entrepreneurship, a panel of experts set up by the NITI Aayog has suggested. 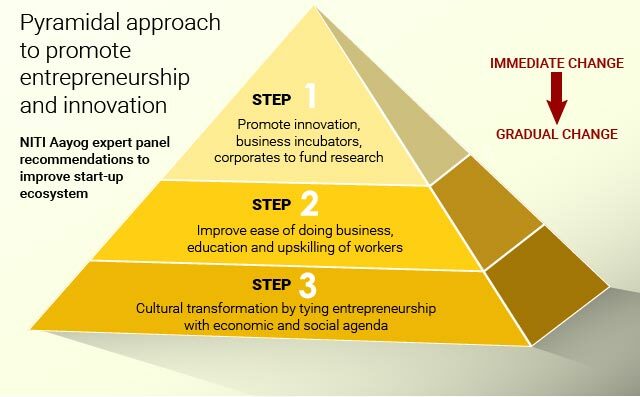 The 15-member committee, in its report, used a pyramidal approach to highlight the problems with the Indian startup ecosystem and suggested both short- and long-term initiatives to transform the entrepreneurial scenario in the country. The committee was set up earlier this year. It was led by Tarun Khanna, Jorge Paulo Lemann professor at Harvard Business School and director of Harvard's South Asia initiative. It included luminaries from the education and science sectors and from private-sector companies. Some prominent names that figured in the panel were Pramod Bhasin, founder and vice chairman of Genpact; Ashish Dhawan, co-founder of ChrysCapital and founder and governing body member of Ashoka University; Swati Piramal, vice chairman of Piramal Enterprises Ltd; Devang Khakhar, director of IIT Bombay; and Ashish Nanda, director of IIM Ahmedabad. The panel said in its report that India needs to generate 115 million non-farm jobs over the next decade to gainfully employ its workforce and reap its demographic dividend. "Given this context, encouraging and promoting self-employment as a career option for young people will be of highest importance," it said. 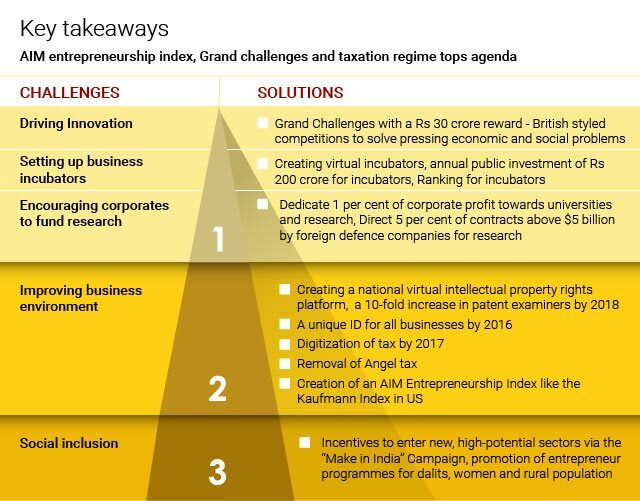 The report highlighted the problems that the country needs to address to encourage innovation and entrepreneurship, and suggested possible solutions. While private investors have been driving the entrepreneurial ecosystem in the country, the government has also started to take initiatives to help startups. Finance minister Arun Jaitley, in his budget speech this year, announced the government's plan to establish the Atal Innovation Mission (AIM) in NITI Aayog and allocated an initial sum of Rs 150 crore to promote entrepreneurship and innovation.